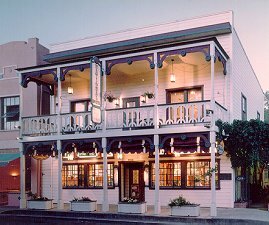 This Gold country inn (1859), one of California's oldest continuously operating hotels is centrally located between Yosemite National Park and Lake Tahoe. You will love our nine award-winning restored hotel rooms each with wonderful brass beds, regal comforters, lace curtains, and private bath. 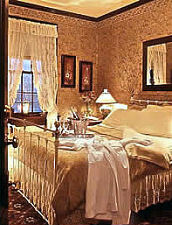 Each room is charmingly authentic, individually appointed, and includes most of the original furnishings. A soaking room with all the amenities is also provided for the guests convenience. You will start your day with a hearty buffet breakfast served at a time to please you. Our highly-acclaimed restaurant is open daily, serving lunch, dinner and Sunday brunch, and one may dine in the garden courtyard if they choose. The award winning wine list features wines from this foothill region, and the original gold-rush saloon is open daily serving a variety of libations. Our warm and friendly staff will tend to your needs. Rates are from $90-140 and all major credit cards are accepted. This and other Yosemite Bed and Breakfast Inns can be found here in The Register.